Items will be shipped via Motor Freight or UPS with delivery confirmation and a tracking number so your item(s) will arrive within a timely manner. We ship all stock items within 24hrs of order confirmation. Orders placed on Friday, Saturday or Sunday will be shipped on the following Monday. 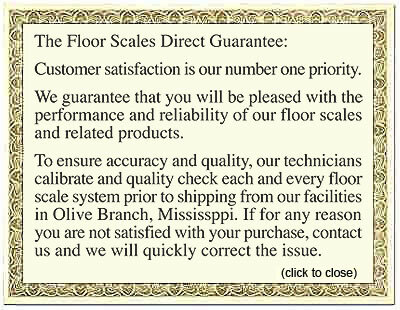 A Floor Scales Direct package must ship to a company address with a dock or forklift or we will charge you $125.00 extra for ordering lift gate if required. Our Shipping/Handling fee includes not only actual postage on your item but also handling, packaging supplies, warehouse costs, and administrative fees.